This is one of the most common complaints of the foot that I see in the clinic. It can be agonizingly painful, but the answer usually lies in working out what has gone wrong in the mechanics of the foot, rather than treating the inflammation causing the pain. The plantar fascia is a thick, tough sheet of connective tissue that covers most of the sole of your foot. In younger people, the Achilles tendon blends in to the start of the plantar fascia, but they are actually separate structures so that by the time you are older there are very few commingled fibres. However this close association can be used in the treatment of Plantar Fasciitis, as stretching the calf muscle can sometimes help relieve symptoms. The “-itis” part of plantar fasciitis merely means that for some reason the plantar fascia has become inflamed. This can happen for a variety of reasons, but the most common is that it has been repeatedly over-stressed during your gait cycle. Usually, this is a result of inadequate footwear. As a culture, we now expect people to be wearing shoes from before they can walk right until the end of their life. This has caused a major problem, in that our feet now never get round to forming sufficient muscle to support the arch of the foot. While we wear good, supportive footwear this doesn’t cause a problem, but if you suddenly start wearing footwear such as flipflops or ballet pumps then there is suddenly no support for your arch and it collapses inwards. So you end up with a non-stretching structure trying to stretch – but not continuously. Without the weight of you standing on your foot, most people actually have a reasonably good arch. 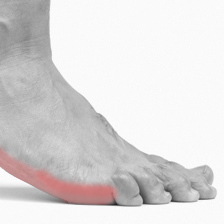 After all, one of the purposes of the plantar fascia is to maintain a flat sheet of tension beneath the arch so that it doesn’t just collapse, but it can’t do that with your weight on it. So every time your foot lifts of the floor as you walk, it springs back to its proper place only to have to stretch out again as you transfer your weight onto that foot. This repeated stretch-release cycle causes damage to the fascia, and that results in inflammation and pain. Often, the damage is not significant enough to hurt if you are just walking around normally in your usual shoes. The difficulty usually comes if you change shoes to a less supportive pair, or if you do a lot more walking than usual, or if you take up an activity such as running. The increase in stress of the structure then causes more damage and you really start to feel it! So how do you know if the pain in your foot is plantar fasciitis, or something else? Well, obviously one way is to visit you Chiropractor and get them to check out all the possibilities, but the most common way plantar fasciitis shows up is severe pain first thing in the morning, and then again after an activity such as a lot of walking or running. Usually, people with this complaint find it is almost impossible to put their foot flat to their floor and bear weight on it for the first 2 or 3 steps after they get out of bed in the morning – it does then ease off quite rapidly, but for that short time the pain is intense. This is because over night, the fascia has stiffened up, the inflammation has pooled around the area and there is very little blood supply around to wash it all away. A neat trick for managing your plantar fasciitis is to freeze a bottle of water, and then in the evening while you’re sitting watching TV, you can rest your foot on the bottle and just roll the bottle to and fro under the sole of your foot. This will calm down any inflammation before you go to bed, and therefore reduce the pain. Clearly, though, this is only a temporary measure as the original injury-causing factors are still there. Your Chiropractor will have to spend time with you isolating what has caused the pain, and then working to make sure that it doesn’t happen again. For example, if you have recently taken up running, it might be that your new running shoes simply aren’t giving you enough support across your arch. This can be rectified by either purchasing some running shoes more appropriate to your structural needs, or getting an orthotic insert fitted to your shoe which you can then slide into whichever shoes you are wearing to give you that much-needed support. Ideally, of course, it would be best to get you to the stage where you have built up sufficient muscular support so you don’t have to have an artificial framework holding your foot in the correct position. There are a few exercises which can be used to help build up this strength, and your Chiropractor will teach you these so that you can work on it at home.